A few years of fun-filled life coupled with intensive education are all that takes one to kick-start his/her career by the end of college. It is obvious that one’s own efforts and talent play a major role in one’s success. However, the apt environment that can increasingly aid a person to realize and showcase his/her adroitness is provided by the college. With the boom in the IT/ITeS/BFSI, companies look for talent that has been nurtured in the right environment. It is here that the Arya College comes to the picture. 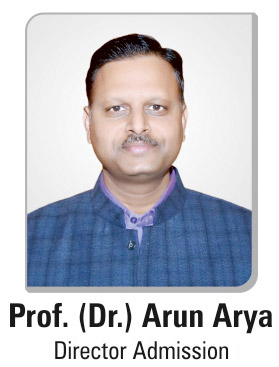 With their brand name that is renowned for quality education imparted on the basis of traditional classroom based teacher-centric methodology, coupled with the best utilization of modern and interactive resources, Arya College becomes a favorable destination for companies to recruit fresh minds. With a fully Wifi enabled campus, out of curriculum laboratories, continuous assessment and challenging assignments by inspiring faculty, the thirst for innovation is fired to scale new heights. The Student Development Cell, in addition to promoting technical events also enables the students to better equip their soft skills by conducting mock interviews, presentations, group discussions and aptitude tests. The Reading and Editorial club organizes literary events that enable students to have a better grasp over the nuances of presenting one’s views in speech and in writing. The Language lab helps the students to improve their communication skills to present themselves confidently before an audience. With the systematic inculcation of all this knowledge, the dedicated Training and Placement Cell shapes it to perfection by its training programs in the eve of placements. By all this, Arya guarantees 99% placements which is no mean feat. Companies of repute and eminence such as Microsoft, Fujitsu, IBM, TCS, Snapdeal and Aditya Birla Group come to Arya campus and recruit students. It goes without saying that Arya Group truly deserves to be the consistent victor of the ‘Best Placements among Engineering colleges’ award.